This is a quick access to the Daily Drill Sections that have been posted so far. 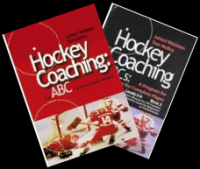 This site by Dean Holden has a lot of articles and discussions on coaching various sports. You can find Drill Manuals with over 1000 drills and games for on and off ice hockey practice here. The first posting has the Games Manual and the other manuals are in the next postings. Wally Kozak (hockey Canada) is using youtube for teaching now..he is using practice footage and then showing NHL footage...this is awesome stuff!! !